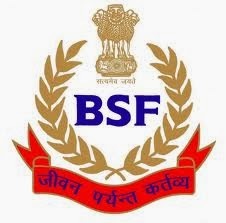 BSF Recruitment 2013 for 196 ASI, HC and CT Vacancies : Border Security Force (BSF) has posted employment notification for the recruitment of ASI (Steno), HC (Ministerial) and CT (Daftry) posts on temporary basis. Age Limit: Between 18 years and 25 years. Crucial date for determination of age limit for the posts ASI (Steno) & HC (Min) shall be 01-01-2014 and for the post CT(Daftry) shall be closing date for receipt of applications fromcandidates in India and not the closing date prescribed for far flung areas. Age relaxation will be applicable as per the rules. Educational Qualification: Candidates should possess Intermediate or Senior Secondary School Certificate (10+2) examination for Post 1 & 2 and Matriculation or equivalent from a recognized Board or Institution for post 3. And Shorthand @ 80 words per minute in English OR in Hindi for 10 minutes for post 1, Typing @ 35 words per minute in English OR @ 30 words per minute in Hindi corresponding to 10500 KDPH in English/ 9000 KDPH in Hindi with average of 5 key depressions for each word on computer for post 2. Selection Process: Candidates will be selected based on Written Examination, Physical Measurement, Short Hand Test, Typing Speed Test, Documentation, Medical Examination and interview. Examination Fee: Candidates have to pay the crossed Bank Draft /Indian Postal Order for Rs. 50/- (Rupees fifty) as the examination fee in favour of the authority to whom the application is addressed, payable at respective SBI/Post office at the location. SC/ST, Women and Departmental (BSF) candidates are not required. How to Apply: Eligible candidates can send their applications in the prescribed format along with fee receipt, self-attested photo copies of educational qualifications and date of birth, three recent passport size photographs, attested copy of Valid Caste certificate, etc and two self-addressed envelopes of 25×12 cms size with full postal address duly affixed stamps of Rs. 39/- on each enclosed in an envelope super scribed with the name of the post applied for should reach to the concerned recruitment center as mentioned in notification with in 30 days from the date of publication of Advt and far flung areas on or before 45 days from the date of publication of Advt. Date of Publication of Advt: 06-12-2013. Last Date for Receipt of Applications: 30 days from the date of publication of Advt. Last Date for Receipt of Applications from far flung areas: 45 days from the date of publication of Advt.